This series of articles we will be setting up a local virtual environment for use in testing Ansible Playbooks. For our example test environment, we will start with a simple configuration of two servers. One domain controller for the CONTOSO.com domain running Windows 2012 R2 and one member server that handles simple file shares. To get started, install these tools on your workstation. VirtualBox and Vagrant install like any other Windows program. Vagrant will install itself to your global path so you can run it from anywhere. No special settings are required the default setup values are fine. This guide assumes you are working on a Windows 10 workstation with an Ansible IDE using VSCode already setup and that you have an empty workspace possibly with a local Git repository. In my examples I will be working in a Git repository cloned into C:\Source\ansible-for-windows\ initially containing no sub-folders and files. I am also assuming that the 192.168.100.0/24 network is unused and available for our test zone. Be sure to make adjustments if this network range is already in use on your network. The first thing we are going to need is some virtual machines to work against so for that we are going to use Vagrant to get our VMs up and running. These will be two Windows 2012 R2 hosts which I uploaded my kkolk/w2k12r2-sysprep-ready vagrant boxes as a base images for. Be sure the ConfigureRemoteingForAnsible.ps1 script is available on your system, it can be found in the Ansible documentation under Windows System Prep. This vagrantfile will spin up what will become our domain controller and first member server. 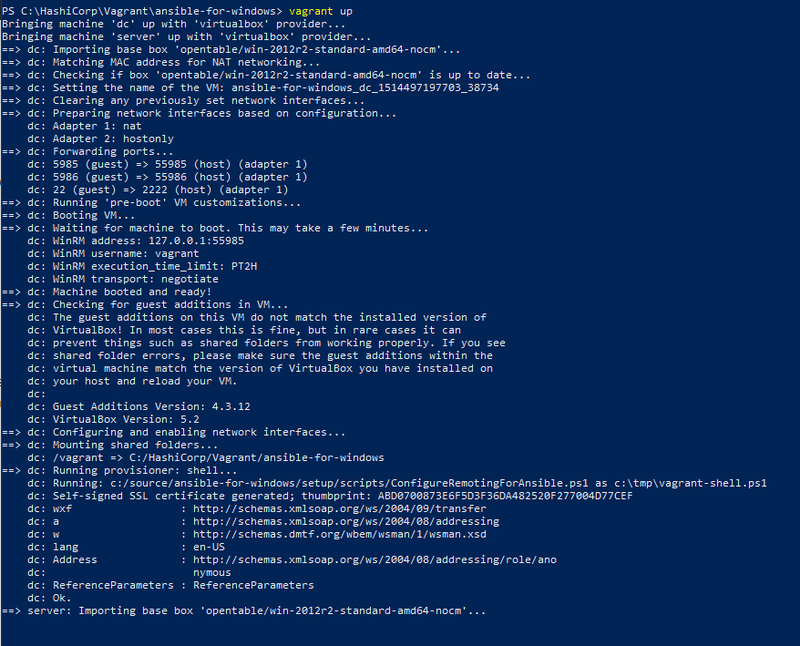 Vagrant will configure them so that WinRM is setup for Ansible to manage them. Create this file and save it to C:\HashiCorp\Vagrant\ansible-for-windows\Vagrantfile. Now we're ready to get to work configuring our servers with Ansible. The first thing we need is a basic inventory that contains the details required to connect to the Windows Servers we are doing development and testing on. 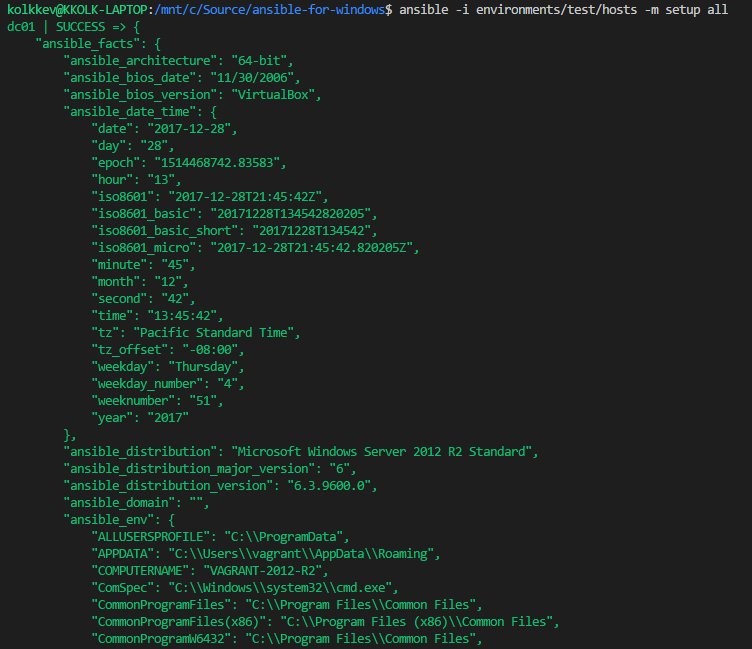 This will allow Ansible to interact with Vagrant created virtual machines for our test environment. Since this will be just a local test environment we'll use the default Vagrant username and password in the images. If you made any IP Address changes to the vagrantfile, be sure to mirror them here. # Using basic authentication because we're using a local account. For more information on Ansible facts and the setup module see the official documentation. This test confirms that we are able to connect to our local test environment and execute commands. With this configuration complete we can move onto Part 2 - Creating our Common Role.